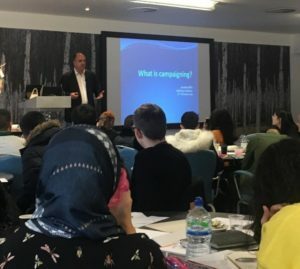 In the last few talks that I’ve given on campaigning in the UK voluntary sector, one theme has kept recurring – the need for passionate leadership. Now you may think that this is a statement of the obvious, but sometimes I do wonder. Over the last decade or so I have seen an increased focus on the importance of professionalism in voluntary sector leadership, with a view that such leaders can’t just be passionate enthusiasts, they also need professional management skills. So for example you see more leaders getting MBAs (of which I must confess I am one). And this focus on professionalism and good management is a good thing – we need our voluntary organisations managed well and efficiently. My concern though is that this move towards professionalism cannot come at the expense of passion. We need both in our sector. We don’t just need a competent manager to lead a charity; yes, we need competence, but we also need passion and commitment to the cause – after all that is surely what makes our sector stand out? At City of Sanctuary, we recently recruited some new regional staff. While we placed an importance on the key professional skills we were looking for – we also placed importance on having a proven commitment to welcoming refugees. As a result we have appointed very competent and committed people, who have further energised our impressive team. I just don’t think that you can take commitment as a given – it is not. And it is superb where you have both proven competence and commitment. I recently spoke at the national leadership conference for UpRising. There were around 100 young people, 16-25 years old, from across the country. What struck me was their enthusiasm, commitment and professionalism. They seemed to embody the call in this post for passion and professionalism with a real desire to use their enthusiasm and skills to push for real change. If these young people represent the future of the voluntary sector, the future looks bright and exciting indeed! ‹ A new blog ….